Weight Loss Success Story with Before and After Picture. Here today for your reading astonishment and pleasure I have a weight loss success story interview with my friend and inspiration, Chris Houchins. I’ve known Chris for several years. She’s a stellar person and great example of what can come from hard work, commitment, tenacity, and willingness to step outside the box. Linda: Chris, could you give us some background about your weight loss journey and tell us about your goals? Chris: It’s been a long journey as I started steadily putting on weight from college to around 2009, taking some off, gaining back, etc. I ultimately got to the point where I accepted myself as a heavier person because of so many failed attempts to lose a significant amount of weight, but set a goal to at least live an active lifestyle no matter what my size. In late 2009 after doing several distance walking/jogging events and one very long biking event, logging food diligently, I put on 15 pounds and decided to really put my doctor on the spot. We figured out I actually had a disorder called polycystic ovarian syndrome, which is a collection of symptoms that have a root in insulin resistance, which is also a precursor to type 2 diabetes. At that point the goal became to reverse the insulin resistance and avoid T2D. I went along for a year or so responding somewhat to the medications involved and slightly modifying my nutrition, exercising regularly, and I dropped a little here and there and was starting to feel better overall. In September 2011 I decided I wanted to do one more half marathon before age 40 and I wanted to really commit and do my best. I signed up for the Shamrock Half Marathon in Virginia Beach, VA the following March (2012), which was just a short drive from our new home in Winchester, VA. I remember saying to my husband that if the training for this didn't help drop some weight, I was giving up. I'd had many years of working out with little to no result and frankly, I was tired of trying. In March 2012 I ran nearly all of the half and finished in a respectable 2:35 or so, and lost 14 pounds. During my training one of my close friends had started weight training as part of her regimen and seeing amazing results. I knew the benefits of strength work from my friendship with Linda and my workouts with another trainer several years ago, and I set the goal to return to lifting once my half marathon training was done. The heavy weights were calling me during my gym visits to take a few classes here and there. I knew it's where I belonged. I started with a new trainer in March 2012 at Golds Gym in Winchester VA. My goals changed again. I wanted to change my body composition and cardio alone wouldn't do that. My trainer counseled me on a nutrition plan that cut sugar, limited grains, and focused on lean meats and vegetables. 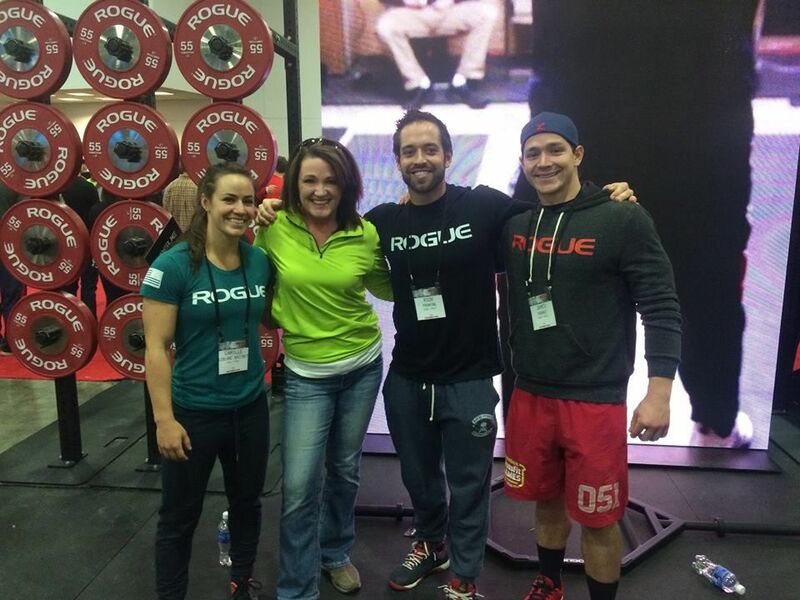 She designed several workouts for me that I could rotate through, adjust over time, and got my form straight on several different compound lifts. I eventually ended up back on my own balancing running, lifting, and nutrition, using internet resources to keep variety in my workouts. Between March 2012 and the end of the year I lost around 20 more pounds and several sizes. My sister and brother in law in Ohio were absolute CrossFit addicts and eating a moderately strict paleo diet, and their results were nothing short of amazing. I just wasn't sure with my knee situation if I could, or should, do it. Meanwhile the local CrossFit affiliate was getting more organized and more popular. 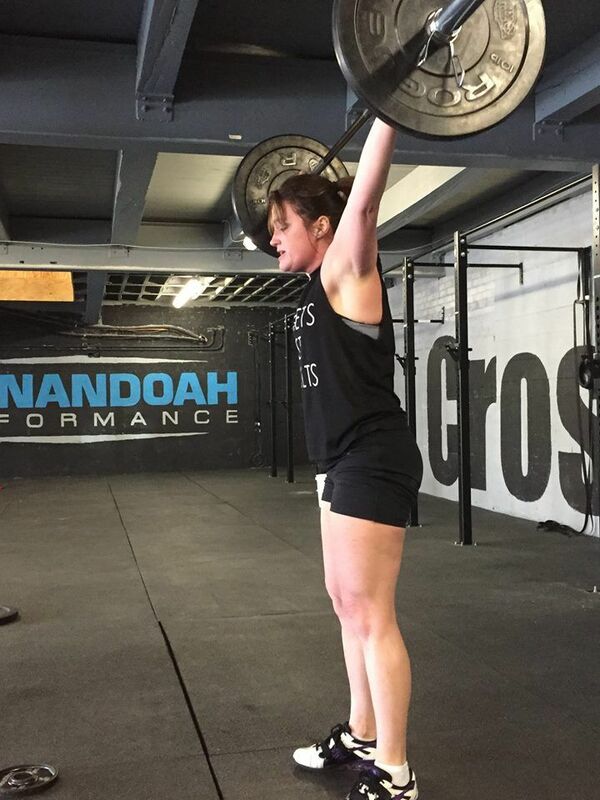 I made contact with the owners, explained my injury, and showed up at what is now Shenandoah Performance/CrossFit Abrams Creek in early November, after I'd lost the majority of my weight. My coaches over the years worked closely with me to make sure my form was spot on and from that day forward, I've been hooked. Now the goal became to get stronger, eat properly, and get the last 20 lbs off, while settling into a lifetime habit of fitness and strength building. Dietary changes I made in early 2012 were a large part of the equation so as 2013 crept up, I set another goal to tighten the eating habits even more. My husband and I committed to a Whole30 in January 2013, which is about the strictest paleo plan out there. It detoxed me from the gluttony of the holiday season and helped me break the last bit of bad habits I still had...some grains and artificial sugars. Now my normal nutrition 80-90% of the time doesn't include grains, sugars, artificial sweeteners, beans, or much dairy. I eat lean meats, vegetables, healthy fats like avocado, coconut milk, olives and limited fruits and sweet potatoes. I eat enough carbs to support my activity level and promote weight loss, between 50-100g per day, and lots of vegetables and protein. I have always hated counting points, calories, macronutrients and the beauty of this system is my body tells me what it needs, and I no longer log food as a general rule. Every so often I log for a couple days to check how I'm doing, and I'm usually spot on. The types of foods I eat don't lend themselves to overindulgence. I do let myself indulge in the things I enjoy within reason, but because I've broken the cycle of addiction to certain foods, it's now a treat, not a need. Linda: What weight loss method/s have you used? Chris: I tried everything including Weight Watchers, Atkins, Slimfast, calorie counting, strict portion control. The most common method I tried was portion control and low fat, sugar free eating. My doctor told me for years that if I ate 1000-1200 calories a day, exercised 3-5 times a week, that I'd lose weight. I didn't. I just got fatter and more unhealthy. I should note though that for a great deal of this time I was on and off antidepressants and used hormonal birth control. I stopped all of that between 2009 and 2010 and I noticed a difference right away in how I carried my weight and how I felt. Combine that with the underlying medical issue that was contributing to my lack of success in significant weight loss. That being said, my lifestyle was not consistently supportive of long term health. While I ate better and exercised as much as or more than many of my friends and family, I still was eating the wrong foods for my body. I subscribed to conventional nutrition wisdom, which is about the most unhealthy thing a human can do. Linda: Can you reveal some tips for those who are trying to lose weight? Chris: Nutrition is the vast majority of the weight loss pie. I absolutely believe that great strides toward better health can be made by just cleaning up your nutrition, if a physical limitation prohibits exercise. You can't outrun or outlift bad eating habits. I personally feel the Food Guide Pyramid is a joke. No one needs to be eating 6-8 servings of grain, whole or otherwise, to be healthy. I don't believe the government is at all accurate on how we should be eating. There is NOTHING in grains nutritionally that cannot be derived from fruits and vegetables. Ditch the sugar, real or artificial. You don't need it and once you are free from the grip of the sugar dependency, you'll be amazed how easy it is to achieve healthy weight. Eat whole, unprocessed, as close to the source foods as you can get. If you can't envision the steps to get it to your table, you shouldn't eat it. Move. A lot. Live an active lifestyle within your physical means. Move heavy stuff often and learn how to do it safely. The biggest tip of all....stop making excuses and take action. Figure out what works for you by stripping your diet and exercise habits down to the bare minimum then adding what makes your life fun. Read The Primal Blueprint by Mark Sisson, It Starts with Food, and the Paleo book of your choice. Allow yourself to succeed. I no longer consider myself to be on a diet, and I cringe when people ask if I'm 'still on a diet'. The way I eat and maintain activity will have the side benefit of lower weight, better health, and leaner body composition over time. I've changed my overall lifestyle this year and it's working. 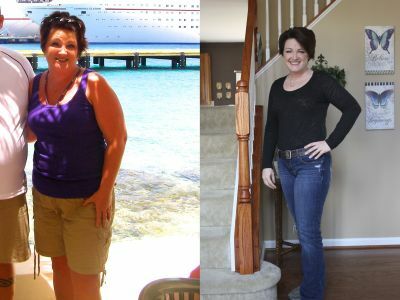 In summary, Chris's weight loss success story continues; she has lost a total of 54 pounds since her journey began in mid 2005, losing 39 of those pounds since 2011, and she continues to lose. I don't know about you guys, but I think Chris is a winner! Chris plans to continue paleo/primal framework as a lifetime lifestyle 80-90% of the time. She says she’d like to lose 15 more pounds and then decide where to go from there. She wants to get stronger and increase her fitness level through CrossFit and biking when spring hits. She says that she wants to focus on changing her body composition, getting leaner and looking better overall. Thank you, Chris, for sharing your story with us. You are a true inspiration!